Whisk together the 1/4 cup olive oil, lemon juice, spices and salt in a bowl. Place chicken in bowl, turn to coat chicken thoroughly, and marinate for at least 30 minutes in the refrigerator. An hour would be even better. Make the dressing while the meat is marinating: place all ingredients in a blender and blend until smooth. Add more lemon juice or salt, as needed, to taste. Heat remaining 1 tablespoon olive oil in a large skillet over medium heat. Add the chicken and cook, turning once, until cooked through, about 5 minutes per side. Discard the marinade. 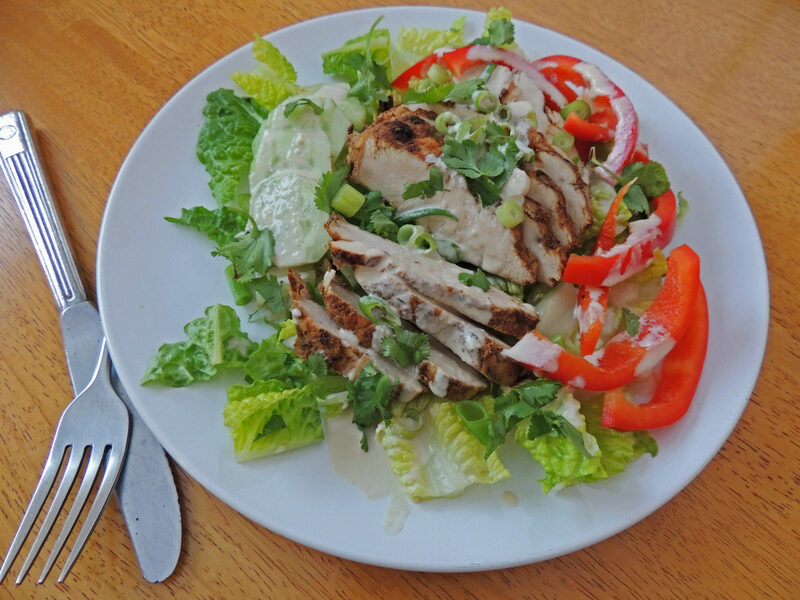 Slice the chicken pieces and serve with the lettuce and veggies and drizzle the dressing over all. This will serve 4 people.